KIT6750: Thermostatic Pre-set Warm Water Bidet Shower Kit This kit provides all the key parts your plumber will require to install this top quality suite at a discount price. 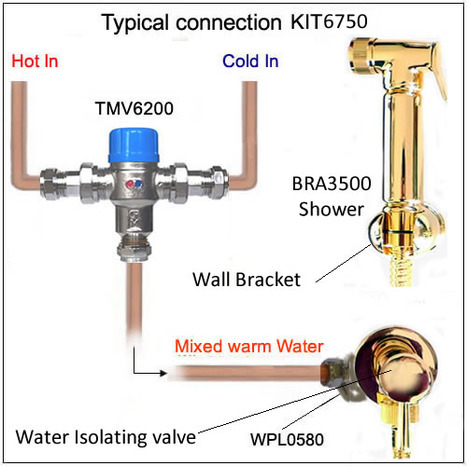 Comprises of the Gold Plated solid meta BRA3500 shower and hose, gold plated ceramic 1/4 turn valve and TMV6200 pre-set Thermostatic Mixing Valve (NOT sown in main image). To view larger images and additional information, click on the image to the left which will the load main page where more detailed information is available. Includes free next business day guaranteed courier delivery by DHL in mainland U.K. (excludes some remote areas of Scotland, we send by Royal Mail first class post to these areas) & from £12.95 to other countries dependent on location. Thermostatic Pre-set Warm Water Bidet Shower Kit. Water temperature is pre-set to the desired operating temperature at the time of installation. The TMV6300 is factory set at 38C we recommend reducing this setting to 35C for bidet showers. The temperature is adjusted by removing the cap and turning the brass head screw in the required direction indicted by the colored temperature markers Kit consists of the following parts. 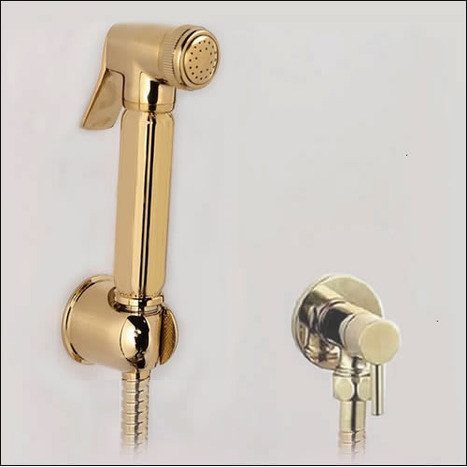 BRA3500 Gold Plated Shower, Hose & Wall Bracket.